Namadgi National Park is beautiful. Namadgi is the only national park in Australian Capital Territory. It contains some great Aboriginal art and beautiful snow gum forests. It covers 105,900 hectares south-west of Canberra and joins Mount Kosciuszko National Park west of New South Wales' border. Namadgi was badly destroyed in 2003 Canberra Bushfires, but things are back to normal now. 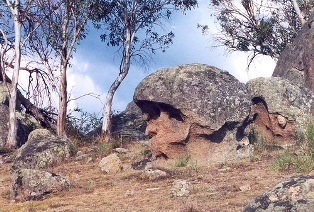 Aboriginal people are known to have lived in the area for about 21,000 years. Evidence from their life can today be seen throughout the park. There are ceremonial stone arrangements, quarries where stone was gathered to make tools, campsites where animal bones lay around, and Aboriginal rock painting, particularly Aboriginal animal art. 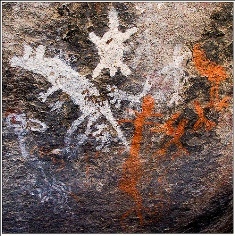 Some good Aboriginal art examples can be seen on the Yankee Trail walking track. British pastoralists arrived in the area in the 1830s and left behind some homesteads that can be seen today. 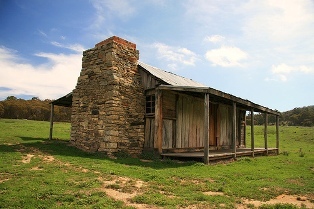 In the 1860s prospectors travelled the Kiandra Gold Trail, and from the 1960s to 1980s there was a space tracking station in Honeysuckle Creek, the first place in the world to see Neil Armstrong walking on the Moon. As in other alpine national parks, the alpine vegetation in Namadgi national park changes with altitude. 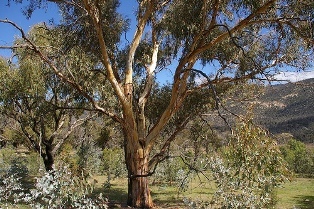 Lower-altitude woodlands are dominated by broadleaved peppermints while higher up they are replaced by snow gums. Wet forests that are found in sheltered locations include ribbon gum, alpine ash and brown barrel eucalypts. There are also areas of open grasslands, either natural (due to the high altitudes), or extended by graziers. Alpine wildflowers such as snow daisies and billy buttons grow on these grasslands. The alpine animals and birds include parrots, eagles, owls, superb lyrebirds, eastern grey kangaroos, red-necked wallabies, wombats, and the black-and-yellow-striped northern Corroboree frog that is only found here and the neighbouring Kosciuszko National Park in New South Wales and are under threat of extinction. They are bred in captivity to ensure their survival. 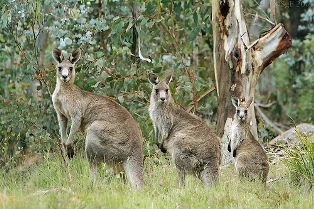 The 2003 Canberra bushfires, one of the worst ever in the ACT, killed many of the park’s animals. Wombats can survive bushfires hiding in their extensive underground burrows. The oldest rocks in Namadgi are sandstone, mudstone and shale, deposited 470-440 million years ago. They contain fossils of small marine animals, showing that the area has been under the water. The many granite peaks and boulders that we have in the Namadgi National Park today are younger, they formed as a result from a large granite intrusion about 400 million years ago. Since the rocks were folded and uplifted in major earth movements 400-350 million years ago, the Namadgi area has been above the sea level. The two distinct geological zones can be seen Yerrabi walk near Boboyan Trig where the eastern rocks are sedimentary while in the west is granite that later intruded into the sedimentary rock. There is a lot to do in Namadgi National Park. During the winter, you can enjoy the snow while during the summer you can spend time camping, bushwalking, fishing, mountain biking, horse riding, or doing some scenic driving. There is information about all these and where to camp in the bush at the Namadgi National Park Visitors Centre. South of the Visitor Centre are the Honeysuckle Campground in the end of Apollo Road, and Orroral Campground on Orroral Road. There are two picnic areas on that road: Orroral River picnic area and Orrorar Valley picnic area in the end of the road. 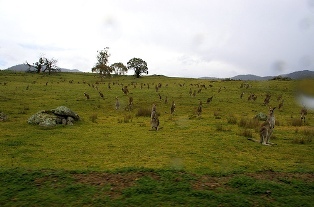 Further south is the Boboyan Road that takes you to Glendale and Yankee Hat picnic areas and Mt Clear and Horse Pound Campgounds, before it continues to Kosciuszko National Park in New South Wales. 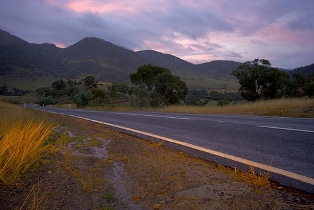 North of the visitors centre is Tidbinbilla Road that takes you to Tidbinbilla Nature Reserve. 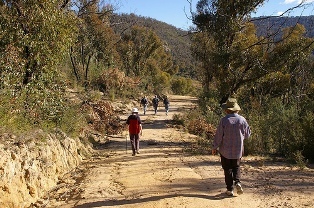 Corin Road goes to Corin Dam, and the Brindabella Road furthest north goes to bushwalking tracks that take you to Bendora Dam, Mt Ginini, and to Tumut in the Kosciuszko National Park in New South Wales. There are picnic areas in Bulls Head, Bendora Dam and Corin Dam, but there are no camping areas in this northern part of the national park. Unless you camp at the campgrounds mentioned above (in the southern parts of the park), your best accommodation options are in Canberra. Here's a map of Namadgi National Park, where I have tagged the places that I mentioned on this web page. You can click on the tags to see what places they are, and double-click anywhere on the map to zoom it in and see the places closer. Drag the map to move around, and if you want to see the satellite image with Google Earth, click on "Sat" in the top right hand corner. Been to Namadgi National Park?